Shannon Larkin and Scott Page are happy in their long marriage, but a tragic loss forces her to delve into the past in order to face ugly truths about her husband. Devastated, she retreats into her own solitary world. A stranger brings her out of self-imposed exile and shows her the beauty of unconditional love exists after all. The Collective Obsessions Saga continues with book seven, The Twilight. Shannon Larkin and Scott Page are happy in their decades-long marriage, but a tragic loss forces her to delve into the past in order to face some ugly truths about her husband. Devastated, she retreats into her own solitary world. A stranger brings her out of self-imposed exile and shows her the beauty of unconditional love exists after all. Although hurt and disillusioned by Scott's secret life, Angie Page finds surprising happiness as a result of her father's duplicity. Her brother Jamie finds unlikely harmony in his marriage of convenience to Désirée Sansovino. In despair over his father's deception, Jamie turns to his flamboyant wife for comfort with life-altering consequences. The brash and grumbling Kevin Larkin finally marries his long-suffering girlfriend Mariko Woods, bringing a much-needed jolt of love and happiness to the family. But will it last? 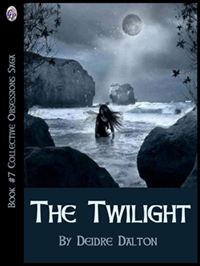 The Twilight was released by Club Lighthouse Publishing in August 2013. Click here to read excerpts from The Twilight. The Twilight by Deidre Dalton is available at Amazon (Kindle), Barnes & Noble (Nook) and in multiple formats at the Club Lighthouse web site. ©2015 Deidre Dalton. All Rights Reserved. Webmaster: Webs Divine.